We had some informal drinks in the cosy upstairs bar – which has a massive selection of cocktails – most are quite pricey but very good. Of course, Malmaison’s location at the heart of the Quayside means this is a great place to look out over the Tyne sipping a drink or two with some accompanying nibbles. We are seated in the private dining room, which is gorgeous in itself, seating 11 of us around a huge circular table. I have heard many complaints of it being “too dark” – think more like atmospheric and moody, but certainly pleasant and social. After more cocktails(! ), bread and tapenade while perusing the menu, I go for ham, potato and fois gras roulade with spiced apple chutney and brioche toast (£6.95, pictured). The meat is chunky and savoury, and with a great chutney – quite tart rather than the usual sugary overload, it disappears quickly from my plate. If i had one complaint it’d be that the toast is a little too crispy rather than being slightly yielding, but a nice sweet contrast to the chutney. The potato on the inside seems more of an afterthought. On a previous occasion I had the frito misto, which I can absolutely recommend – soft and fresh mixed seafood in a light salty batter with tarragon aioli, and one of the few places where squid and prawns aren’t cooked down to rubber. A must-try. On the reverse of the menu we have a local food sourcing list, for which I applaud Malmaison. It’s easy for larger chains to go for cheapest-to-plate option – but a lot of local ingredients are seen here – even if it’s not explicit on the menu items themselves. 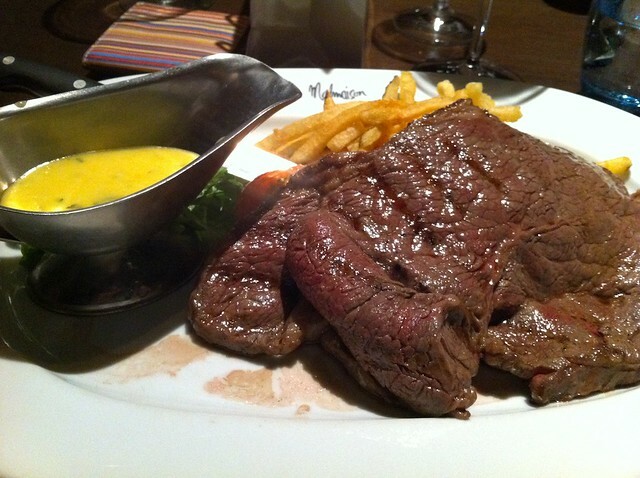 For mains – Malmaison now hosts a steak night on a Thursday – so of the five cuts available, I asked for a recommendation – and was told rump steak with béarnaise sauce (£17.95, pictured) would be best. The menu is otherwise quite fish oriented – I can recommend from a previous visit the lobster spaghetti – an indulgent Malmaison speciality. The Aberdeenshire (local?) rump was unusual in that it comes quite thinly sliced – it is truly a plate-engulfing slab of meat! However, the flame-grilled flavours and as-ordered medium-rare are super-satisfying. The beef is clearly of a good quality, soft and succulent, and gorgeous when accompanied by the béarnaise sauce – which could have been a little more shallot-y for my tastes. It’s hard work to get thorough it all – but it does represent good value for money. Red wines are order of the day – I try a gorgeous cabernet sauvignon, and a pinot noir (Katnook Founders Block, AUS and Spy Valley, NZ respectively). I didn’t see a list price, but both are excellent and a spot-on match for the beef here. Sides are also worth a mention – very good crispy fries – amazing for mopping up the buttery goodness of the béarnaise, light and crispy home-made onion rings, and grilled courgettes topped with parmesan cheese are a popular choice that are simple yet to die for. I would have preferred the option for proper fat “chips”, but I guess this is the steak frites dish. Service is absolutely impeccable – but I would expect no less with the GM of the hotel present! Nonetheless, the sommelier is very knowledgeable about the wines, which is always a good sign – and the waiting team are happy to talk to you about menu choices, so I’d expect the standard to be high across the brand. 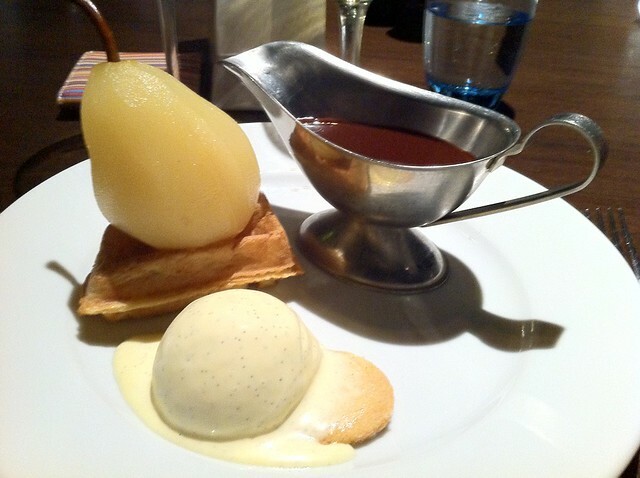 Dessert was a pleasant surprise – belgian waffle, poached pear, valhrona chocolate sauce (£5.95). While I could do without the old-school gravy boat, the chocolatey goodness inside is divine – and the accompanying madeleine and vanilla ice cream, drizzled with it, are maybe even better than the (slightly firm) pear and waffle. Paired with an outstanding dessert wine – a pretty good dessert, and not too heavy, all things considered. 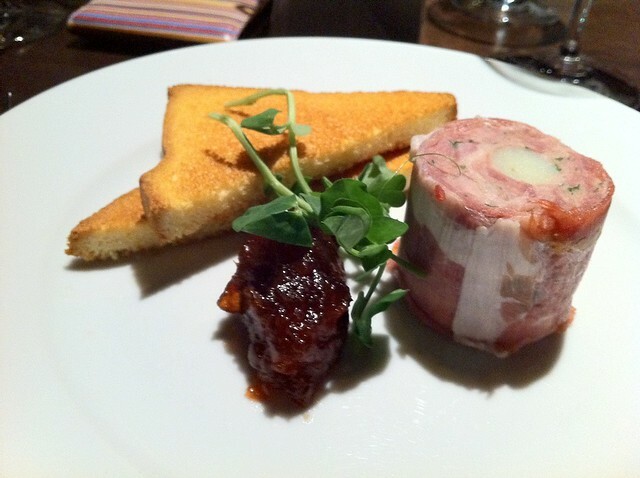 Aside from a great value two courses & wine for two for £30 set menu – with many events happening, such as a evening with their cheese expert, wine tastings and fishmongers nights – I will certainly be returning, and would recommend you do the same. 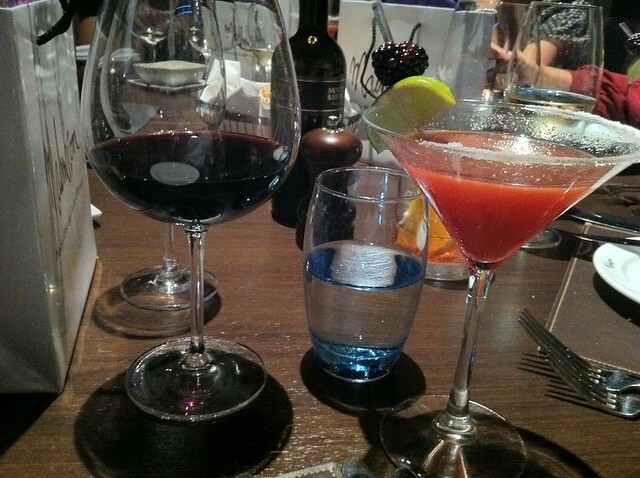 Updated: read about our adventure on one of Malmaison’s wine tasting nights here!